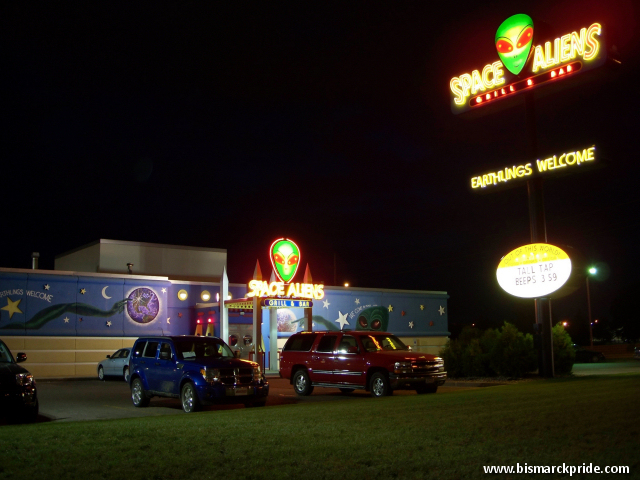 Space Aliens Grill & Bar at night in Bismarck, North Dakota. Space Aliens was established by Mort Bank in 1997. Its second location, in Fargo, opened two years later. Today, there are six total locations in North Dakota and Minnesota. Restaurant used to have a dome on top of the entry, but it was badly damaged in the infamous Bismarck June 2001 hail storm and never replaced. Mr. Bank had previously opened several themed McDonald’s restaurants in North Dakota, including the McDonald’s Rock-N-Roll Cafe on Main Avenue in Bismarck.